There will be a meeting today at lunch in room 146 for JV and Varsity girls’ basketball players. The final session for the Art STEM module with Mrs. Nafziger and the Natural Resources STEM module with Mr. Bruner is today! Meet in Mrs. Nafziger’s art room and Mrs. Meller’s science classroom after school. Today is the last day to sign up for the last STEM module for this school year! Basic robotics will be offered and taught by John Waidelich starting next Friday. A few openings are still left if you have not signed up yet. See Mrs. Miller or Mrs. Meller if you have questions. Attention Spanish Club: Enchilada Day is tomorrow. Please double check the time you signed up to work. See Mrs. Richer if you still need to sign up. Tickets are on sale in the office today for the 34th annual Four County All-Start Cage Classic to be played this evening at the New Bryan High School. Gabe Beck, Alexa Leppelmeier, and Lynnsey Crouch will be representing Pettisville. Tickets are $5 and all proceeds benefit Special Olympics. The girls’ game begins at 7:00 PM with the boys’ game to follow. There will be a 3 point contest and slam dunk contest in between games. Activity Period today will be for NHS and FCCLA. NHS will meet in Mr. Bracken’s room and FCCLA will meet in Mrs. Bacon’s room. All other students should report to homeroom. Thursday, March 30, 2017 - Students in 7th grade math are conducting surveys to gather information from our student body. They may approach you at various times and in various ways. Thank you in advance for your respectful participation! This a reminder to the officers of the National Honor Society of the meeting during lunch today in Mr. Bracken’s room. This meeting is for officers only. The final session for the Art and the Natural Resources STEM modules will be tomorrow. Please make sure you can attend. Please see Mrs. Miller or Mrs. Meller if you have questions. The last STEM module for the school year will begin next week. An introduction to robotics will be taught by John Waidelich using the Arduino microcontroller kits. Space is limited to 12 students for the robotics module and sign up will be on a first come first serve basis. Sign up list is posted on Mrs. Meller’s science classroom door. Sign up ends tomorrow. Tickets are on sale in the office today and tomorrow for the 34th annual Four County All-Start Cage Classic to be played on Friday, March 31, at the New Bryan High School. Gabe Beck, Alexa Leppelmeier, and Lynnsey Crouch will be representing Pettisville. Tickets are $5 and all proceeds benefit Special Olympics. The girls’ game begins at 7:00 PM with the boys’ game to follow. There will be a 3 point contest and slam dunk contest in between games. The baseball and softball games with Hilltop today have been cancelled. Wednesday, March 29, 2017 - Students who sold cookie dough: Your order will be available today starting at 2:45 in the atrium. Please make sure to pick up your orders. The final session for the Art and the Natural Resources STEM modules will be Friday. Please make sure you can attend. Please see Mrs. Miller or Mrs. Meller if you have questions. The last STEM module for the school year will begin next week. An introduction to robotics will be taught by John Waidelich using the Arduino microcontroller kits. Space is limited to 12 students for the robotics module and sign up will be on a first come first serve basis. Sign up list is posted on Mrs. Meller’s science classroom door. Sign up ends Friday. All Juniors need to meet in the study hall 1st period today. There will be a meeting of the officers of the National Honor Society on Thursday during lunch in Mr. Bracken’s room. This meeting is for officers only. Detention today will be in room #150 with Mr. Horning. 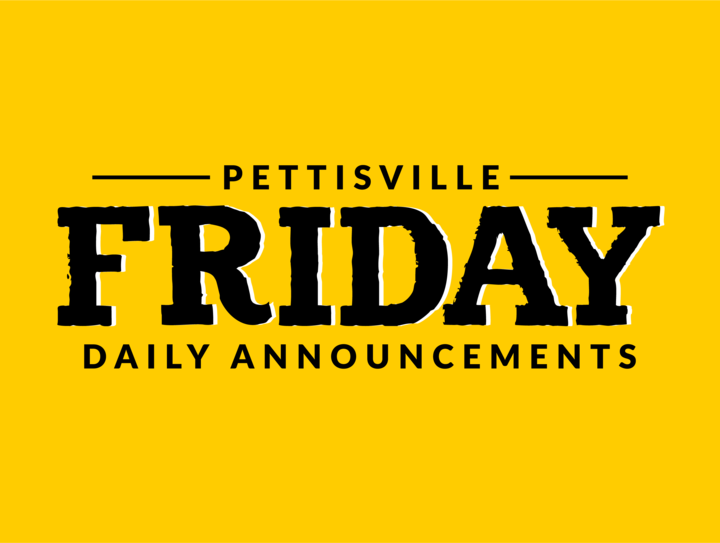 Girls: Montpeleir – 50; Pvill – 48; Fayette – 27. Grace Schnitkey won 100, 200, and Shot Put. Boys: Montpelier – 50; Fayette – 34; Pville – 32. Max Leppelmieir won 1600 & 800. Tuesday, March 28, 2017 - The boys’ baseball game today has been moved to Hilltop and the game Thursday will be at Pettisville. This is a reminder to students who sold cookie dough and tumblers. Your orders will be available tomorrow starting at 2:45 in the atrium. Please make arrangements for your orders to be picked up. The final session for the Art and the Natural Resources STEM modules will be this Friday. Please make sure you can attend. Please see Mrs. Miller or Mrs. Meller if you have questions. There will be a meeting in the commons for players in the ping-pong tournament at lunch today. The JH meeting will be at 11:25 and the HS meeting will be at 11:45. NHS members and 7th graders: The literary lunch bunch will meet today. Wednesday, March 29th, all juniors need to meet in the study hall 1st period. All people participating in the Ping-Pong tournament during lunch: There will be a meeting tomorrow in the commons for junior high at 11:25 and for high school at 11:45. This is a reminder that varsity and JH track pictures are today after school in the varsity gym. For students who were involved in the Art and Natural Resources STEM modules before spring break, the final session will be this Friday. Please make sure you can attend. Please see Mrs. Miller or Mrs. Meller if you have questions. The last STEM module for the school year will begin next week. An introduction to robotics will be taught by John Waidelich using the Arduino microcontroller kits. The focus of this module will be the introduction of robotics. Space is limited to 12 students for the robotics module and sign up will be on a first come first serve basis. Sign up list is posted on Mrs. Meller’s science classroom door. Sign up begins today and ends Friday. 11 students attended the Ohio Junior Sciences and Humanities Symposium at Bowling Green State University March 15-17. Gretchen Lee, Jacob Dennis, and Jordan Skates presented PowerPoints of their science research papers to a panel of judges. Heath Waidelich, Tommy McWatters, Madeline Shumaker, Dalton Myers, Matt Rupp, Aaron Rupp, and Jessica McWatters presented their research to a BGSU professor in the poster session. Kenzi Rivera was a delegate. Jordan Skates was selected at a 4th place finalist out of 25 presenters and won $500 cash award and a trip to the National Science and Humanities Symposium in San Diego, CA at the end of April.